FREDERICKSBURG --- Martha McFarland was absolutely giddy Tuesday morning seeing the newest baby for the first time. Standing in a wagon that usually carries tour groups, the 34-year-old rancher noticed a reddish brown head pop up in the lush, green pasture. A rare and welcomed sight in the latter half of June at the Hawkeye Buffalo Ranch near Fredericksburg. "We have a baby. Yeah! Finally," McFarland yelled as she checked on the herd. Her father, Dan McFarland, smiled and nodded in relief as he sat on an old Farmall M tractor hitched to the wagon. The ranchers were wondering if this day would ever come. Bison typically calf in the spring, according to the American Bison organization. In 15 years of raising buffalo, the McFarlands said this is the latest birth ever on their farm. "When you're trying to expand the herd, oh, I'm so glad we have a calf," Martha exclaimed. By the looks of the bellies of a few other cows among the 25-head herd, the farmers hope a few more babies will arrive soon. Expansion can't happen fast enough, the McFarlands said. Demand for buffalo meat is booming. The value of bison meat sold in grocery stores, restaurants and farmers markets nationally topped $278 million in 2011, according to an economic analysis released last month by the National Bison Association. Sales jumped 15.8 percent compared to 2010. At the same time, the number of bison commercially processed nationwide dropped 16 percent last year to 53,680. Producers are holding back animals to build herds, the report said. "The economic data underscores the great connection that bison producers have made with customers across the country," said Dave Carter, executive director of the association, in a prepared statement. 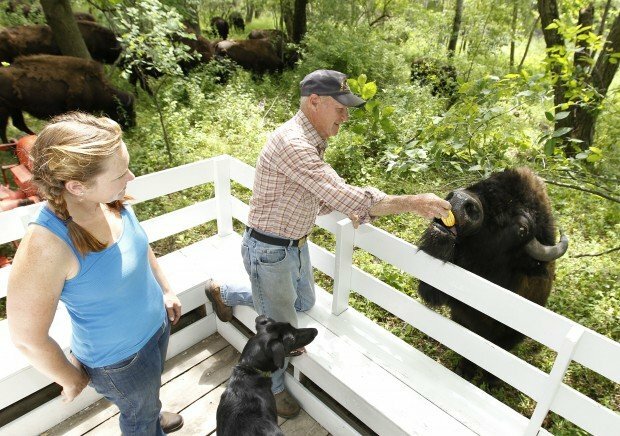 Every person who visits the Hawkeye Buffalo Ranch --- located about five miles southwest of Fredericksburg, 3034 Pembroke Ave. --- leaves with a better understanding about the giant animals that once ruled the Great Plains. The McFarlands make sure of it during a 90-minute tour, which includes a history lesson and hands-on interaction with the animals, which roam hundreds of acres of sprawling pasture. Guests can feed the beasts ear corn by hand. "It's like ice cream to buffalo," Dan said. The McFarlands also talk about how buffalo meat is a healthy protein choice because it's low in cholesterol, fat and calories. 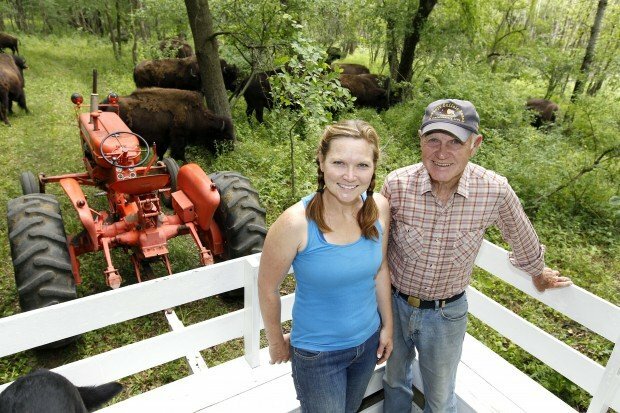 Due to local and national demand for bison meat, the McFarlands have a tough time keeping enough supply on hand. The Sumner Locker processes the family's animals. "We just can't keep meat in the freezer, burger especially. The tricky part is bison is more expensive since there's not the mass production," Martha said, noting expansion is a must. Hawkeye sells meat on the farm and via mail order. Ground buffalo costs $6 per pound, while sirloin steaks sell for $13 per pound. A host of other cuts are available. The RiverLoop Public Market in downtown Waterloo has a tough time keeping buffalo meat in stock as well. The store buys U.S. Department of Agriculture-inspected buffalo from a Wisconsin wholesaler. "That (buffalo) and lamb are flying out the door," said Matt Robbins, assistant manager and butcher. "Some people prefer (buffalo) over beef because it's so lean." Plus, Robbins said the increase in beef prices the past year has made buffalo seem more affordable. Though still more expensive than beef, the difference at the retail level has shrunk. Dan McFarland started raising buffalo in addition to polled Hereford cattle in 1994 to diversify and ensure the survival of the century farm. The business overcame a downturn in the bison market about five years ago. "There's ups and downs. I've been through that in the cattle business," Dan said. At 79, he's grooming Martha --- a teacher by trade --- to take over. Martha quit her job at Colorado State University last year and moved home. "We're in it for the long term," she said. The ranch is open daily year round. Reservations are recommended for tours: $10, adults; $8, seniors; $5, students and kids are free. A family pass is $30. For reservations call (563) 237-5318 or visit the farm's website, www.hawkeyebuffalo.com.